An ECG can show the electrical activity of your heart. It will appear as a pattern on a graph. It can help to show abnormal movements or working of the heart. There are no major problems linked to this test. Be asked about your health history. Your chest may be shaved. You will be asked to lie quietly on your back. Six small, sticky pads will be placed across your chest. Other pads will be placed on your arms and legs. Wires will be attached to the pads. The wires will also connect to the ECG machine. You will not feel anything during the test. You can return to your normal activity after the test. Call your doctor if you have heart-related symptoms. This includes chest pain or trouble breathing. 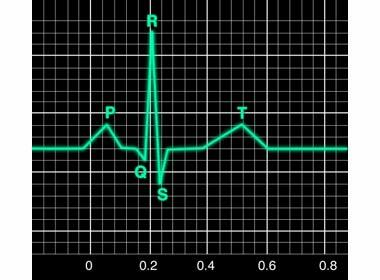 Electrocardiogram (EKG or ECG). American Heart Association website. Available at: http://www.heart.org/HEARTORG/Conditions/HeartAttack/SymptomsDiagnosisofHeartAttack/Electrocardiogram-ECG-or-EKG%5FUCM%5F309050%5FArticle.jsp. Updated September 11, 2015. Accessed March 5, 2018. Noninvasive tests and procedures. American Heart Association website. Available at: http://www.heart.org/HEARTORG/Conditions/HeartAttack/SymptomsDiagnosisofHeartAttack/Non-Invasive-Tests-and-Procedures%5FUCM%5F303930%5FArticle.jsp. Updated September 16, 2016. Accessed March 5, 2018. What is an electrocardiogram? National Heart, Lung, and Blood Institute website. Available at: http://www.nhlbi.nih.gov/health/health-topics/topics/ekg/. Accessed March 5, 2018.